One of the most frequent questions that I receive from my readers is this: Where do you find your inspiration? The answer to this question is as simple as it is complicated. Why? Because in some ways you have to search for creative inspiration and yet in other ways it stares you in the face every single day. Inspiration is all around you, train yourself to see it! My #1 polymer clay tip is learning to see what’s around you. Inspiration can be found all around you in the great outdoors: moss growing on trees, flowers, vining ivy up a tree, leaves, swamp mold, lily pads, grass, butterflies, birds, and so much more. Inspiration can be hiding just inside your home: the pattern on your duvet, the texture on your couch, that gorgeous rug you bought last year, the veggies in your fridge. Inspiration lies deep inside of books, movies, even television! The thing is this, you have to choose to see it in order to be inspired. I was recently inspired by this picture I found while rummaging through google for ideas for a brick wall. Do you know what it is? It’s a portrayal of the “Secret Garden” from the book “The Secret Garden” be Frances Hodgson Burnett … but do you know what that image became? That image became a part of a Parker’s story, it became a hallmark of a “new chapter” in Parker’s world. This image recreated itself in Parker’s world, Kater’s Acres, and became the entrance to the Magic Forest that he found. Read more about it here. 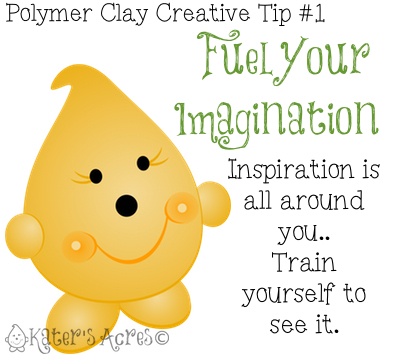 Some of my followers may have noticed on Twitter I have started tweeting out some tips to help your polymer clay creating. I started sending out some of these tips about a month ago. Every day I tweet new tutorials, polymer links, fun, & oodles of information, so if you don’t already follow me, come on over and follow me now!